Ladies, it is may – MAY. We have just one month of school left and I am struggling. I forget my preschoolers backpack every other day. Yesterday we woke up 15minutes before we were supposed to leave the house. I have stopped signing the show and tell forms all together and yesterday I dropped her off in my yoga pants. This is what it has come to. I started out so strong, class snacks came straight from pinterest, her hair was made up each day (mostl) and her backpack was well organized. That has to count for something. But the weather has made a turn for the better and I finished my finals last sunday. Which basically means I just want to run around outside at the park, and have picnics, and not send my child to bed while it’s still light out. But alas, it’s not meant to be for atleast the next 23 days. So if you’re limping towards the end of the race with me you’re going to appreciate this super easy-peasy after school snack. Are you ready for this? Preheat oven to 350degrees Spray baking sheet with cooking spray. Pop open Crescent Rolls, try not to jump. Half cheese into triangles, apply 1 triangle to each cresent roll. Add one slice of lunch meat. Bake about 10minutes until golden brown. Feed to incredibly grateful children and pat yourself on the back. And if you insist on still being pinterest mom these are easily turned into a more sophisticated dish. I make them the following way as an awesome appetizer for girls night: apply a dab of garlic spread to the rolls, then add goat cheese and (precooked) bacon. Finish by basking in the compliments of your friends. You’re welcome! Wow, my picky kids might actually like this one. I’m going to give it a try. My son would love these, he’s all about snack time! So easy and yummy! Those are my favorite kind of foods. Thanks for sharing. Ahhh, love this simple recipe! 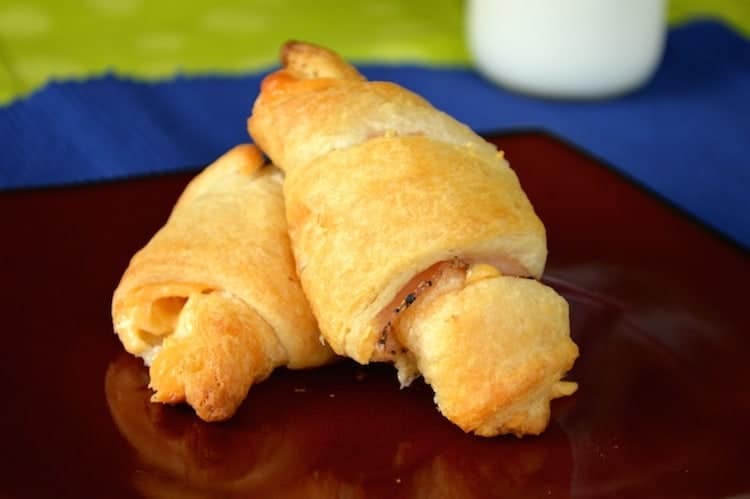 I have some rolls in my fridge, making these today – thanks for the delicious idea! That looks like a perfect snack for my little guys. I’m going to make it this week!